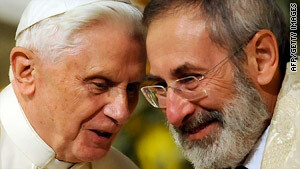 Pope Benedict XVI talks with chief Rabbi Riccardo Di Segni on Sunday in Rome's main synagogue. Rome, Italy (CNN) -- Pope Benedict XVI visited the main Jewish synagogue in Rome on Sunday, a trip that unfolded amid heightened tension between Catholics and Jews. Benedict was the first pope in 24 years to visit the Tempio Maggiore, or Great Temple. He called on Catholics and Jews to keep an open dialogue and work together to tackle problems, such as poverty and disease. "As Moses taught ... and as Jesus affirms in the Gospel, all of the commandments are summed up in the love of God and loving-kindness towards one's neighbor," the pope said, according to a Vatican transcript. "This rule urges Jews and Christians to exercise, in our time, a special generosity towards the poor, towards women and children, strangers, the sick, the weak and the needy." Christians and Jews "share to a great extent a common spiritual patrimony," but "often remain unknown to each other," he said. "It is our duty, in response to God's call, to strive to keep open the space for dialogue, for reciprocal respect, for growth in friendship, for a common witness in the face of challenges of our time, which invite us to cooperate for the good of humanity ..."
The visit to Rome's synagogue is part of what should be an annual Catholic Day of Dialogue With Judaism, but it didn't happen last year. The Vatican had reinstated an ancient prayer calling for the conversion of the Jews, decades after it was shelved as part of 1960s-era reforms. Italy's Jewish community pulled out of the 2009 Day of Dialogue in protest. The Vatican smoothed feathers by re-wording the prayer. But then it revoked the ex-communication of a renegade bishop, Richard Williamson, who turned out to be a Holocaust denier. Benedict apologized and visited Israel. Then he moved Holocaust-era Pope Pius XII a step closer to sainthood. That rankled the Jewish community in Rome, where Nazis rounded up Jews on Pope Pius XII's watch, said Lisa Palmieri-Billig, the American Jewish Committee's liaison to the Holy See. The Vatican says Pius XII worked behind the scenes to save Jews from the Holocaust, but it has refused to open archives from his tenure to show proof. It also says a papal statement outlining the late pontiff's heroic virtues was not meant to offend Jews. Jewish groups have called on the Vatican to open its archives on Pius XII. The Holy See says scholars eventually will be able to examine the paperwork, but not for several more years because of how long it is taking to catalogue and organize. Riccardo Pacifici, president of the Rome Jewish Community, reiterated calls during Sunday's service for the Vatican to open the archives. "The silence of Pius XII still hurts today as an opportunity missed," he said. The pope might not have been able to stop the Nazi deportation trains, Pacifici said, but he could have conveyed solidarity and comfort simply by speaking out. He acknowledged the church's role in helping save some lives and noted that Catholic nuns saved his father during World War II. During his address, Benedict recalled his 2006 visit to the Auschwitz concentration camp. "The rulers of the Third Reich wanted to crush the entire Jewish people," the pontiff said. He said many Catholics helped Jewish fugitives whom the Nazis were "hunting down" for deportation to concentration camps. He also said the Vatican provided help -- "often in a hidden and discreet way." Yet the pope acknowledged that others remained indifferent. He said the Catholic Church has deplored the failings of its adherents, begged forgiveness for actions that "contributed to the scourge of anti-Semitism and anti-Judaism," and looked forward to warmer relations between Catholics and Jews. "May these wounds be healed forever," he said.